FILE - In this May 11, 2011 file photo, Rep. Renee Ellmers, R-N.C. takes part in a news conference on Capitol Hill in Washington. Republicans romped last November, gaining 63 House seats to secure the majority, winning 11 governorships in places such as Ohio, Michigan and Pennsylvania and seizing control of most state legislative seats they've had since 1928. The GOP is capitalizing on its across-the-board control in 26 states, governor plus legislature, in the census-based drawing of a new political map that will be a decisive factor in the 2012 elections and beyond. Rep. Renee Ellmers is being challenged by House GOP primary candidate, Kay Daly, who in a new ad saying she's "hunting RINOs." Daly's ad calls Ellmers a "feminist" and a "RINO" (an acronym for "Republican in Name Only") before she fires her gun at the end of the video. 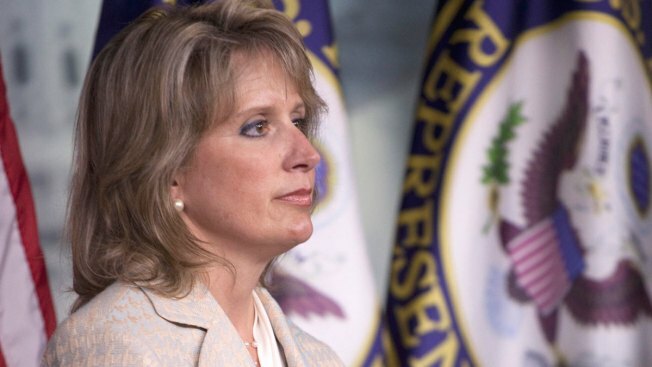 The narrator of the ad accuses Ellmers' for voting "to let homosexuals pretend they're married" and for raising "the debt ceiling twice to pay for abortions in D.C. to fund 'Planned Butcherhood.'"